The Communist Manifesto is probably the most read political pamphlet in history. Although it was first published in 1848, it remains an excellent starting point in understanding socialist ideas and how to fight capitalism today. 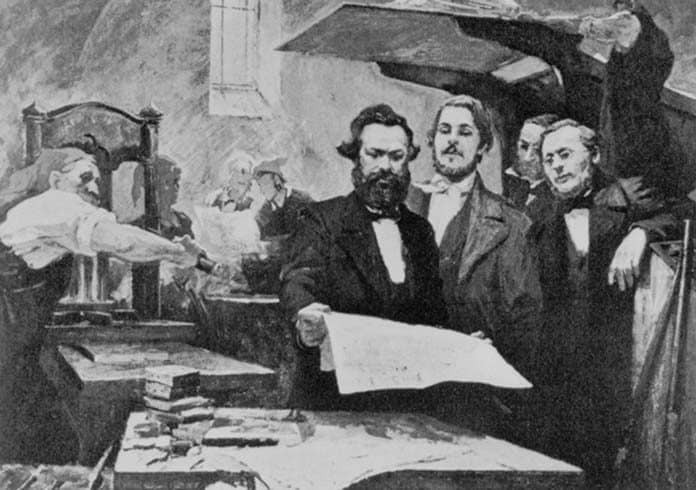 Karl Marx and Friedrich Engels were active in the debates among early socialists and communists in Europe. They were tasked with writing the manifesto by an organisation called the Communist League. This revolutionary communist organisation mostly consisted of German radicals living in Brussels, London and Paris. At the time there were a number of competing strands of socialist thought. The Communist Manifesto was commissioned to make clear the League’s programme and outlook. Since history began, society has been made up of one group of people ruling over another. For example there have been master and slave, patrician and plebian, lord and serf—“in a word, oppressor and oppressed”. The development of capitalism out of feudal society did not result in the end of class conflict, but instead established new classes: the bourgeoisie (or capitalists, those that own the wealth and means of production such as the factories) and the proletariat (the working class). The Manifesto provides a brilliant sketch of the Marxist theory of history. At the time Marx and Engels were writing, remnants of the feudal system, where kings and lords ruled over serfs working the land, still lingered in much of Europe. The bourgeoisie had seized power through revolution in France only a few decades previously, overthrowing the French monarchy. Capitalism developed within feudal society as a radically new way of organising production, based on waged labour by workers who were formally free, not enslaved or bound to a feudal lord. The new ways of organising economic life led to new ideas about the world and how it should be run, challenging established ideas and institutions. And yet capitalism is also based on the degradation and brutalisation of the working class. And the system periodically lurches into economic crisis, creating unemployment and human misery. Capitalism is the first form of society, Marx notes, where crisis results not from the shortage of food, shelter and other goods, but from over-production. In the pursuit of profit, companies produce more goods than can actually be sold. To overcome the crisis, they have to either destroy productive forces (through bankruptcies that see the dismantling of machines and infrastructure), find new markets for their goods, or increase workers’ exploitation further. Often this only means that the next crisis is even more destructive because the underlying difficulties in increasing profits remain. Alongside the emergence of the bourgeoisie was the growth of the working class. Under capitalism, everything becomes a commodity. Our labour has a price just like bread, milk or any other product. That price is our wage. And the employers generally pay workers as little as they can get away with. The bourgeoisie profit off workers’ labour by paying less than the value of what they produce. The wage a worker is paid by their boss then usually goes straight into the pockets of another section of the bourgeoisie (the landlords and supermarket owners) when a worker pays rent and buys food and other basic goods. But the working class have the power to challenge this situation. Even in 1848 with the system in its infancy Marx and Engels could see the potential power workers had, “with the development of industry, the proletariat not only increases in number; it becomes concentrated in greater masses, its strength grows”. The establishment of factories and other workplaces brought together workers in large numbers. But brought together in a workplace, facing the same problems, workers began to stage strikes and protests to defend their interests against the bosses. Workers have a particular power in that they can stop production and paralyse society. They are both a product of capitalism but also have the power to destroy it. But what would a socialist society look like? One of the Communists’ main aims should be the “abolition of private property”, the Manifesto argued. Under capitalism, a small minority own most of the world’s wealth. No matter how hard they work, at best a worker might be able to afford a house and a car and a few other possessions. Control of the factories, workplaces and major companies allows the bourgeoisie to set the terms on which everyone else works. Abolishing private property does not mean taking away the meagre possessions of individual workers. It means the majority of society taking democratic control of production—deciding what is to be produced in each workplace and how it will be distributed. Despite countries such as Russia and China once calling themselves Communist, workers there had no democratic control as described in the Manifesto. Although there was no private property and state control of the economy, there was a ruling class running things just as corporations in the West do. This is best described as state capitalism. The capitalists, whether they be state officials or corporate CEOs, profit off our labour and use the wealth to accumulate even more factories, companies and land. Marx and Engels wrote in the Manifesto, “The working men have no country. We cannot take from them what they have not got.” The working class have a common interest worldwide to fight the exploitation and oppression that they face. Its publication coincided with the eruption of revolution across Europe. In Germany a coalition of the bourgeoisie and the emerging working class rose up demanding parliamentary elections and democratic freedoms. Marx and other members of the League returned to Germany to become active in the growing movement. Marx launched a daily newspaper, Neue Rheinische Zeitung, with the aim of deepening the revolution. But the German bourgeoisie proved to be more frightened of the working class movement than the old autocracy, and abandoned the revolution to defeat. The workers’ revolutions the Manifesto predicted have broken out again and again in the 170 years since it was published. From Germany in 1918 and Italy the year after, China in 1926 to the Spanish revolution of 1936-39, France in May 1968 and Portugal in 1974, Poland in 1981 or the Egyptian revolution of 2011, the possibility of workers’ revolution has exploded time and again. Yet none have so far succeeded in bringing about the socialist society Marx predicted. The best example in history to date is Russia in 1917, when workers took power in a major country for the first time. But the capitalist powers of Europe combined to help isolate and crush the new workers’ state through famine and civil war. Stalin’s dictatorship was the end result. Workers in Russia were only able to take power because they had a mass revolutionary party, the Bolsheviks, able to organise and cohere the working class into a force that could overthrow capitalism. The lack of such a party has seen other revolutions end in defeat. Socialists have to organise within the working class to push the struggle against the capitalists forward. In Australia, the top 1 per cent own more wealth than the bottom 70 per cent combined. Worldwide, inequality is on the rise. At the same time, the working class is growing internationally and continues to hold the power to challenge capitalism that Marx and Engels describe in the Manifesto. It is therefore no surprise that the Communist Manifesto continues to be widely read. A different world is possible, and the Manifesto is a good starting point for understanding what we are fighting for, and how to get there. Who were the utopian socialists?